In my former life when I was dentally and medically qualified and had a practice with 8,000 private patients (1957 – 2007) these hands were very, very busy. I think the last time they stopped for a moment or two was about 1942 when, as a 4 year old , I was playing with my Mother’s Singer Sewing machine, turned the handle and caught my thumb in the needle at the back and was impaled! Stopped in my tracks and painful too! Once released, I kept them, safe and working. Much water has passed under the bridge since then and as a busy Dental Surgeon, having also taken a Medical Degree, I worked at what I would call an artistic science, using hand-eye skills to the greatest degree of accuracy and perfection. When I had a needle stick injury in 1987 and caught Hepatitis B from a patient who was apparently a carrier, I had a forced absence from practice for nearly 4 months. I started sculpting in my bedroom and despite clearing the virus and returning to full time surgery I had, ‘out of the blue’, mysteriously become a sculptor and have never stopped creating works of art since that ‘fateful’ day. 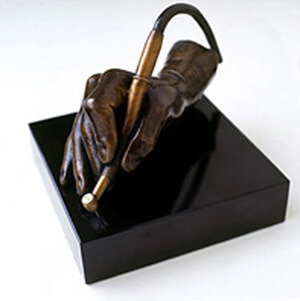 This is my right hand, cast in bronze, wearing a dental rubber glove and holding a Kavo drill. 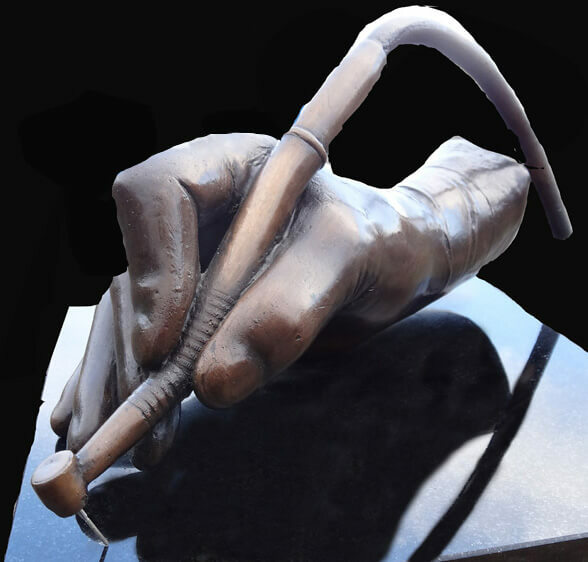 This commission, from the Birmingham Dental School, was to make a work of art to be used as an annual prize for a best student and also to commemorate one of the University’s great dental surgeons. So far as I know, it is still awarded today. In that respect this work is unique, although I do own an artist’s proof.